Hello friends in blog-land. I don't think it's possible to tell you how excited I am that Week 28 of 52Q is finally here! I'm Raeann McIntosh from Fort Worth, Texas. I'm a full time wife and mom, part time nurse, all the time nerd, and incessant crafter and creator. I've been married to my best good friend, John, for 8 years. We just celebrated our 144th month-a-versary (12 years since we started dating) by signing a contract to build our first home. So exciting. We have two daughters, Rowan and Ellie Brynn. Ro is 6....and a half. She's very quick to correct if you get it wrong. EB is 3...and a half. She has to do whatever big sister is doing. They are kind and adventuresome, and creative, and fun and I couldn't feel more lucky to be their mom. I'm also the social media coordinator for the Fort Worth MQG. You can follow the guild on IG and Twitter @fortworthmqg and via blog at Fort Worth Modern Quilt Guild. I'll be taking you along to our July meeting later this week. Some of you know that sewing was a spur of the moment decision for me. Almost exactly 2 years ago I was sitting at the dining room table with my hubs just chatting when I said, "I think I'm going to go buy a sewing machine". I went to JoAnn's about half an hour later and purchased my Singer Curvy. I brought it home and started playing with it and my life has never been the same. I've never had a formal sewing lesson. Just about everything I know about sewing and quilting I learned from Pinterest, YouTube, and Instagram. You may even be someone who inspired me to try new things. Once I discovered that I could draw any picture I wanted on my machine with a darning foot my love of quilting really took off. I do make bed size quilts, but what I love is to make art quilts. I think part of that is the quick turn around. It's so satisfying to go from a pile of uncut fabric to a completed work in just a handful of hours. I also love that it enables me to try a wide range of ideas without committing to the time and cost of a large quilt. Hanging a quilt on the wall as a piece of art appeals to my love for a variety of design styles and incorporating texture into visual art. Because I love to make art minis and because I've had more than a few requests for info on my creative process, I will be working through one of my designs with you here on 52Q this week. 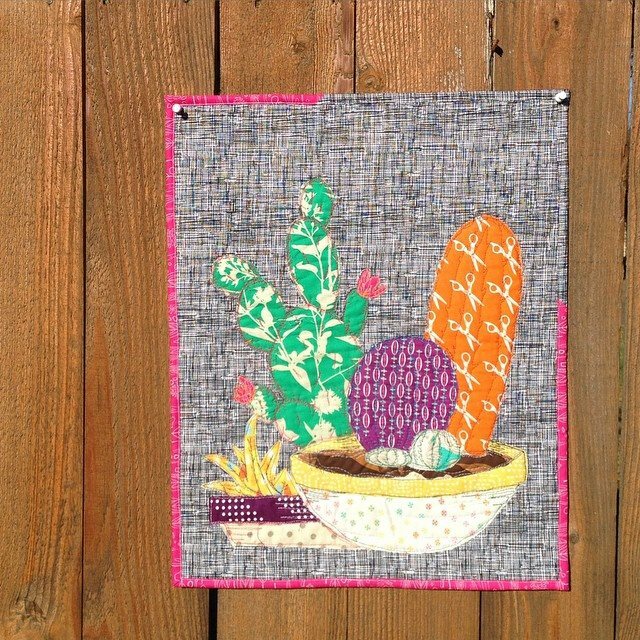 Specifically, we will make my Succulent Garden applique quilt. Stay turned for my next post, which will have an applique pattern download and instructions to get started. I'm so excited for this opportunity to create this week. 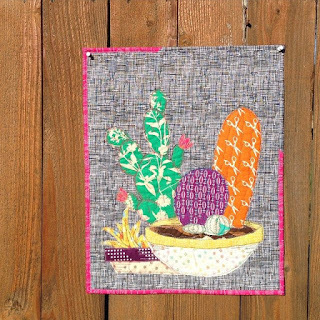 If you decide to follow along, tag pics to IG and Twitter with #52Qsucculentgarden.